A rain shower in the morning gave Moto3 just a slim dry line to play with, while Moto2 had a dry run before the rain returned at a MotorLand Aragon circuit poised for some enthralling race day action. Moto3 saw Sky Racing VR46 rider Romano Fenati make up an incredible 12 places on his assault through the pack for the win, including an epic last lap battle where he timed his move right to get the better of main rival for the win Alex Marquez. The Estrella Galicia rider may have missed out on the top spot on the podium, but second still gave him plenty to celebrate as his points combined with his earlier collision with Jack Miller, which left the Red Bull rider out of the points meant the Spaniard took the lead in the championship standings. An excellent recovery from Danny Kent saw him lose a great start and battle back for third aboard his Husqvarna, fellow Briton John McPhee crashed twice leaving him out of the points after running at the front. Marquez’s team-mate Alex Rins finished fourth after running off track, fifth went to team Calvo’s Jakub Kornfeil who did the same, while Enea Bastianini took sixth for Junior Team Go&Fun. Top Mahindra honours went to Miguel Oliveira in seventh, just ahead of Ambrogio’s Brad Binder in eighth, Nico Antonelli held on for ninth as Alexis Masbou moved his Ongetta-Rivacold into a top ten finish. Just missing out while battling hard was wild card entry Hiroki Ono, for Honda Team Asia who impressed in eleventh. The remaining points finishers were Isaac Vinales (Team Calvo) in 12th, Efren Vazquez (SaxoPrint-RTG) in 13th, Jules Danilo (Ambrogio Racing) scoring his first points of the season in 14th and Zulfahmi Khairuddin (Ongetta-AirAsia) in 15th. The weather meant the crash list was long with Grunwald, Ferrari, Hanika, Guevara, Tonucci, Navarro, Migno, all joined Miller and McPhee in crashing out. Moto2 had a very different feel with Paginas Amarillas rider Maverick Vinales leading a group of his rivals around from pole before breaking away at the front for just his second Moto2 victory. The rookie impressed as only Championship leader Tito Rabat attempted to reel him in pulling him away from the pack and clear into second for Marc VDS, extending his championship lead to 33 points in the process. The battle for third remained tense between Johann Zarco and Tom Luthi, the two Suter riders endlessly swapping position over the closing laps. AirAsia Caterham’s Zarco nudged ahead when it counted , leaving Interwetten Paddock rider Luthi to settle for fourth. Franco Morbidelli had an amazing race to take fifth for Italtrans, Dominique Aegerter battled past Mika Kallio late on for sixth, Kallio settled for seventh, having previously also lost out after many laps fighting with Luthi. Aspar’s Jordi Torres took eighth, though much further back than the leaders, Speed Up’s Sam Lowes finished ninth, just Ahead of Tech 3’s Marcel Schrotter who completed the top ten. Eleventh went to Hafizh Syahrin (Petronas Raceline Malaysia), with Sandro Cortese (Dynavolt Intact GP) twelfth to cross the finish line. 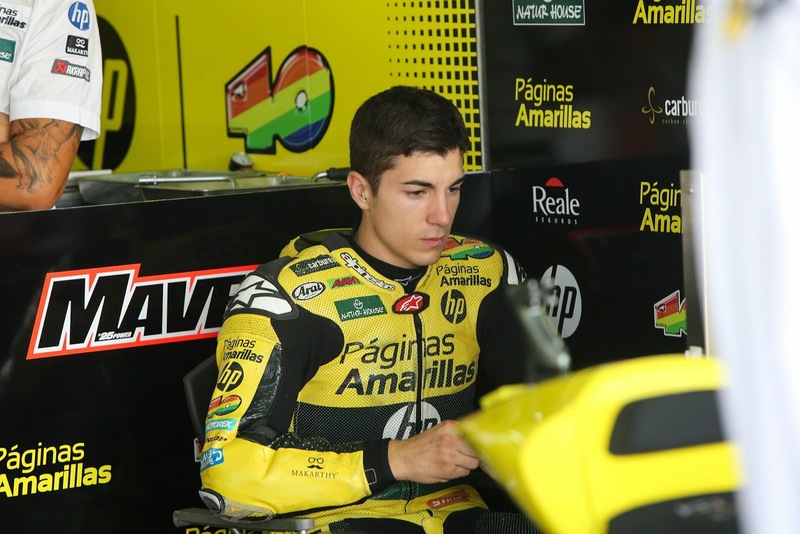 The final points went to Luis Salom (Paginas Amarillas HP 40) in 13th, Tech 3’s Ricky Cardus in 14th and Taka Nakagami (Idemitsu Honda Team Asia) in 15th. Gino Rea picked up seven places from his qualifying position to finish just outside the points in 17thfor AGT REA Racing. Falling out of contention were Ant West, Xavier Simeon and Axel Pons.